Sara is a gorgeous, champion, therapy dog who has PRA, read her story here. PRA is a hereditary eye problem that causes dogs to go blind. There is currently no cure for PRA. The gene for PRA in Mastiffs has been found! It is a dominant trait and is the same as one that causes Retinitous Pigmentosa (RP) in people. There is now a DNA test for Mastiff PRA offered by OptiGen. For more information go to OptiGen's web site: www.optigen.com. What can YOU do to reduce the incidence of PRA and other eye problems in Mastiffs? Have their eyes examined by a veterinary opthamologist, preferably one affiliated with CERF (the Canine Eye Registry Foundation), every year at least until the dog is 6 years old. Significantly reduce the risk of your future pup developing eye problems by requiring that the pup's parents be proven clear of the PRA gene and recently CERF examined. If the sire and/or dam has not been proven clear of the PRA gene or has not been recently CERFed, require that these be done before you get your pup. Get copies of the eye exam sheets - these sheets are given to the owner when the dog's eyes are examined. Read the information provided below, ask questions, prove the sire and dam free of the PRA gene by DNA testing them or their sire and dam, CERF all of your dogs before breeding, CERF all of your puppies before they leave, and require that all outside dogs bred to yours be CERFed prior to breeding. Get copies of CERF exam sheets for yourself and your puppy buyers. Require that your puppies be CERFed annually. DO NOT BREED any Mastiff that has PRA. Murphy, one of the "Meagles", has been diagnosed with PRA. Click on the link above to read more. Also read Thoughts on Murphy by Jane Walsh. Includes copies of Sara's electroretinagrams (ERGs). How you can help put an end to PRA by Kimberley Wall, appeared in the Mastiff Reporter . How to reduce the incidence of PRA until there is a DNA test for PRA. Includes a list of PRA affected mastiffs. List of CERF vets by state. CERF's phone number is (765) 494-8179. True story of an owner of a mastiff with PRA that appeared in the Mastiff Reporter in March 1995. Section from the Mastiff Stud Dog Register dealing with CERF and eye problems in mastiffs. Letter to the editor of the MCOA Journal in 1995 concerning eye problems in mastiffs. 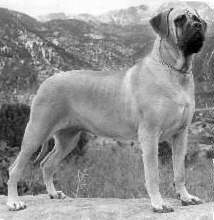 In 1995 only 296 mastiffs were examined for CERF compared to the 1,150 mastiff litters and 4,245 individual mastiffs which were registered that year. One third of those 296 had at least one eye problem. In 1997, 468 mastiffs were examined for CERF and one third had at least one eye problem. Dog Gains Fame as a "Stuffed Animal"